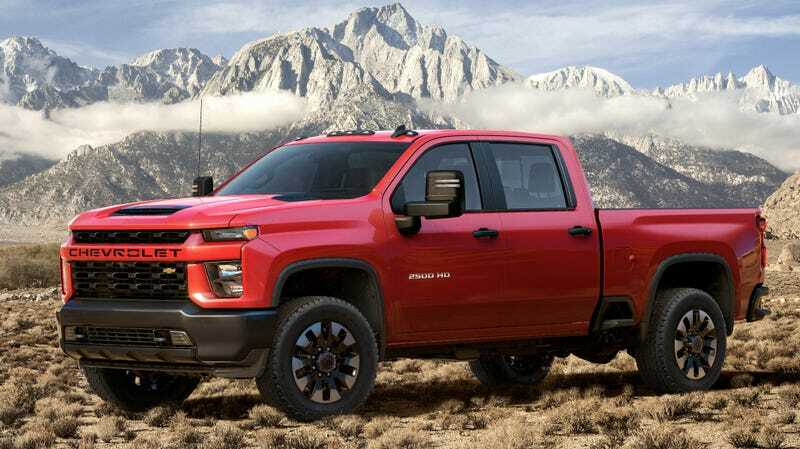 Chevy has finally revealed the full lineup of the 2020 Chevrolet Silverado HD, which is now available with a 6.6-liter Duramax turb-diesel V8 with 910 lb-ft of torque and capable of towing a max payload of 35,500 pounds. Whew. Compare all of this to the recently updated Ram Heavy Duty, which has a max towing capacity of 35,100 pounds from a 400 hp 6.7-liter Cummins diesel with 1,000 lb-ft of torque, or a less-powerful version of the same 6.7-liter diesel with 370 HP and 850 lb-ft of torque. There’s also a 6.4-liter gasoline option with 410 HP and 429 lb-ft with the Ram. Ford also has a recently updated truck, teased earlier today, but has yet to announce any real torque, towing or power figures, but did claim its gas V8 would be the most powerful in its class. Anyway, back to the new Chevrolet HD lineup, it will be offered in five different trims. The Work Truck, with the black grille bar backing the Chevrolet name, Custom, which is only available on the 2500 model and gets the body-colored grille bar, LT and LTZ, which get chrome accents, and High Country, which gets the big bow tie grille. The diesel trucks will get bigger hood scoops and Duramax decals on the hood. The trucks also get a new, larger bed-side step that’s rated for 500 pounds now, a new 15-angle trailer camera setup with a feature that makes it possible to see-through the trailer that’s being towed as if it’s transparent, an easy-fill diesel exhaust fluid tank on diesel models, simpler snow plow attachment points in the front, and a new Park Grade Hold Assist that activates all four brakes on the truck, not just the parking brake. Pricing will be announced closer to the summer, when the new HD goes on sale.